When you install Exchange 2003, not only does it expand the schema but it also adds specific exchange performance counters. 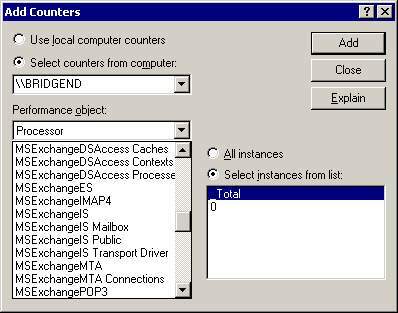 Incidentally, you also see more services, for example Microsoft Exchange System Attendant. As you look for bottlenecks, think how you could improve the service as cheaply as possible, for example move mailboxes to another server. The more you understand the way Exchange 2003 works, the more you can identify then predict where bottlenecks occur. Performance monitor will help you not only improve responsiveness, but also show you how the Exchange components route the mail messages. 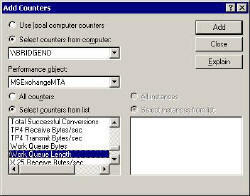 The key to detecting Exchange 2003 bottlenecks is to find, then measure queues. Guy’s rule of thumb is a queue bigger than 2 is evidence of a bottleneck. This is the most important counter because it gives the total of all queues. Increase memory, add another stick of RAM. More disks, with more disk controllers. Put Exchange on its own dedicated server. Add a second or third server so that each site has a local Exchange server. Deploy front-end / back-end servers. The front-end servers handle the connections and authentication, the back-end store the actual mailboxes. Lateral thinking and root cause analysis. Too much spam, get a good filter, swamped with the SoBig virus, better virus checker. 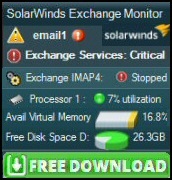 Monitoring Exchange Servers is probably the most difficult of all monitoring tasks. The secret is to start by examining the Windows Server 2003 ‘big 4’ counters, Memory, Processor, Disk and Network. 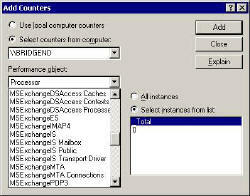 Once you have checked that they are not causing the bottleneck, then seek the Exchange specific counters, for example, MSExchangeIS and MSExchangeMTA.